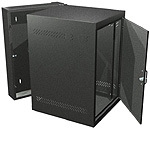 Wall-Mount, Swing-Out, 4-Post-Mounting Enclosed Racks. 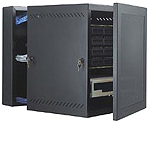 Wallit™ Swing-Out racks provide 4-post 19" rack-mounting capability on a swing frame within a distribution enclosure, that is designed to be mounted to the wall. Wallit™ Swing-Out enclosures feature a center swing-out section that gets closed off with a front locking Plexiglass door (or an optional solid door). The swing-out capability offers outstanding front and rear access to cables and equipment mounted on the 19" rack-mount vertical mounting rails. Wallit™ Swing-Out's rear wall-mount section features top, bottom, and rear knockouts for cable conduit and fittings, providing for easy cable entry, and convenient maintenance. 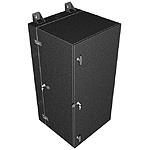 The fully welded Walit Swing-out enclosures are constructed of heavy-duty 14 gauge steel, and feature a reversible mounting design, making left or right hand swing-out possible. The center swing-out frame consist of two sets of pre-tapped #12-24, 11 gauge steel, 19" rack-mount vertical mounting rails (with an adjustable depth positioning in ½" increments) , in which optional shelves and accessories may be positioned at any desired height. 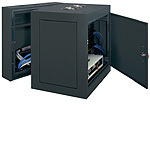 Wallit™ Swing-Out GP facilitates the most common Telco distribution applications in an accessible wall-mount enclosure. Wallit™ Swing-Out HD features high weight capacity to facilitate demanding Telco distribution applications in an accessible wall-mount or caster-mount enclosure. Wallit™ Swing-Out DP facilitates mounting deep equipment within a Telco distribution application in an accessible wall-mount or caster-mount enclosure. Wallit™ Swing-Out N12 facilitates protection against dripping and splashing of liquids within a Telco distribution applications in an accessible wall-mount enclosure.